That’s a question I’ve long struggled with myself, as I do often find myself frustrated by the relative difficulty of most of the MMOs I’ve played. The more I try to answer that question, though, the more I realize it’s so much more complicated than it seems at first glance. First we need to discuss what true difficulty actually is. This feels like it should be obvious, but there’s a lot of misunderstanding of it in the gaming community, especially where MMORPGs are concerned. Firstly, tedium is not challenge. One tests your skill, while the other simply tests your patience. A lot of people who talk about MMOs being so much easier these days simply mean that you no longer need to spend hours looking for a group so you can spend an hour getting to your destination so you can spend hours grinding the same mobs over and over. That wasn’t difficult. That was just time-consuming. Similarly, I’m not convinced that simply having harsh punishments for player error — like corpse runs or perma-death — necessarily makes for a truly challenging game. Certainly corpse runs could prove a challenge, but things like that mostly serve to make players risk adverse, and if you’re not also challenging players before they die, then you’re just adding a tax to people who lag or go AFK. For perspective, the most challenging MMO I’ve played to date was the original incarnation of The Secret World, and it also had arguably the most lenient death penalty of any MMO I’ve played. Only gear repair fees that were so small as to be utterly trivial. Didn’t stop the game from being so hard I almost threw my monitor out the window a few times. And then we need to consider that not all difficulty necessarily makes for interesting gameplay. 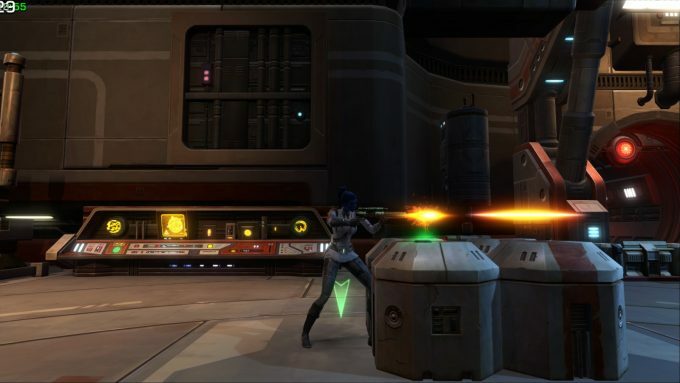 You can triple the health and damage of every enemy in an MMO, and it will definitely make the game harder, but it may not make it anymore fun. What defines interesting difficulty may vary a bit from person to person, but broadly speaking I would say it’s about testing your ability to react (such as active dodge or block mechanics), to strategize (such as saving cooldowns or resources for a crucial moment), to adapt (such as adjusting your build to meet a specific challenge), and to coordinate (such as forming a plan with your teammates to tackle a difficult encounter). And there are other things that make it difficult to determine just whether MMORPGs are too easy or not. For one thing, difficulty is somewhat subjective. Two people can play the same content and come away with one feeling it was too easy and the other feeling it was too hard. Challenges that are trivial for dedicated MMO players can still be significant hurdles for someone who is new to the genre, or new to video games as a whole, and on the other hand someone who is used to challenging themselves playing very difficult games like Dark Souls or StarCraft may find even relatively challenging content to be a cakewalk. The social aspect of MMORPGs further complicates matters, because your experience of the game is affected by the skill level of your fellow players as much as your own. I’ve had easy dungeons turn into miserable slogs because of the crumby players I’ve been matched with, and I’ve had very difficult content made absolutely breezy through the assistance of top-tier players. The fact that MMOs are social games also means that there may be some value to skewing things toward the easier end of the spectrum. It’s a terrible feeling if you can’t play with your friend because their skills aren’t up to the task — and an even worse feeling if you’re the one your buddies have to carry. 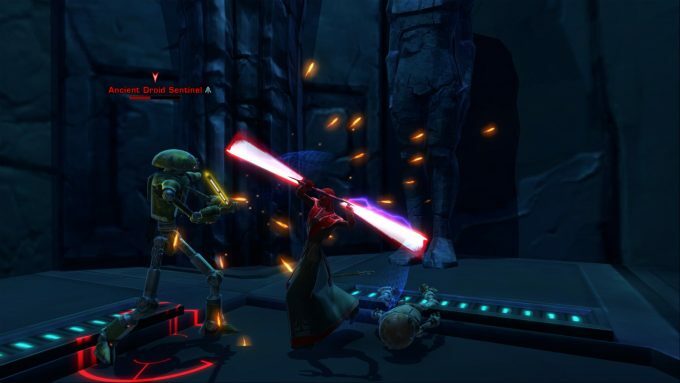 Making MMOs easy allows them to cast a wide net and attract the greatest number of players. This means there’s more people to meet and more potential for social bonds to form. It also means a greater potential pool of customers for the developers, which is probably the real reason most MMOs tend to be fairly easy games. So from that perspective, an argument could be made that MMOs should be catered to the lowest common denominator. And finally, let’s not forget that the MMO industry’s devotion to vertical progression means that most any content can eventually be made easy with enough gear, further blurring the definition of what an acceptable level of difficulty would be. So now that we’ve gotten all that out of the way, let’s answer the real question: Are MMOs too easy? In a word, yes, but I’m not sure that captures the real issue. My opinion on this is mainly based on the “WoW clone” model of design that so long dominated the MMORPG industry, and to some extent still does. In World of Warcraft and its copycats, it’s generally the case that the large majority of content is extremely easy. This is especially true of open world content, where enemies are tuned to be so weak that they’re almost never a credible threat unless the player does something incredibly dumb. This is less true of games outside that mould, but only slightly. 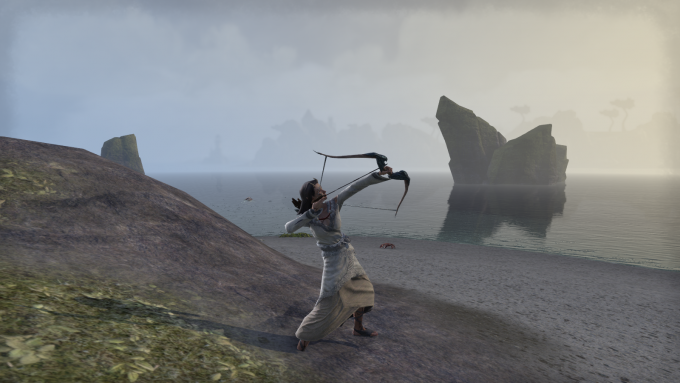 You can’t sleepwalk through open world content in Elder Scrolls Online, but it’s not exactly strenuous, either. But here’s the thing: Those games do have challenging content. Very, very challenging content. 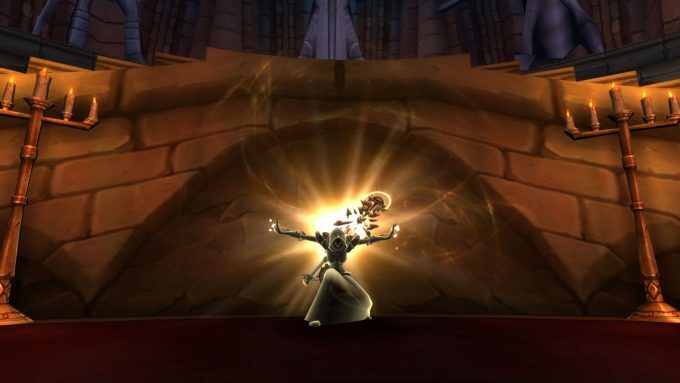 Mythic raiding in WoW is brutally difficult. It requires meticulous coordination between players and virtually perfect execution of both your class’s abilities and the encounter’s mechanics. And most MMOs have some equivalent high end content. 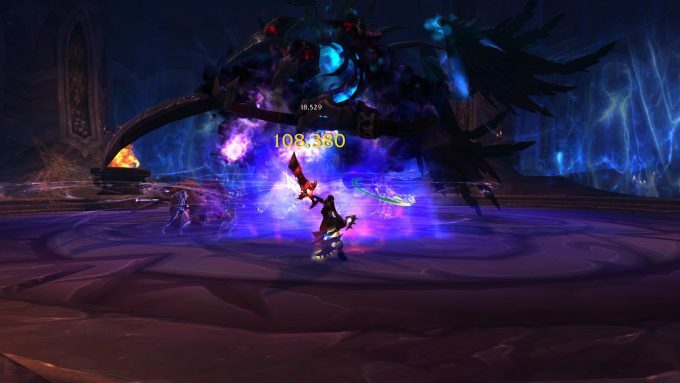 It might not all be as ruthlessly unforgiving as mythic raids, but there’s usually something for the adrenaline junkies among us. So we have a lot of easy content, and some hard content, but that leaves us missing something very important: mid-tier difficulty. Content that is moderately challenging is all but unheard of in MMOs, and I think that’s where the real feeling of MMOs being too easy comes from. If I’m being honest, I would rate my skill as roughly average or at best slightly above average. I will not pretend that I am up to the task of mythic raiding or its equivalents. I’m just not good enough. I am, however, good enough to find most content in most MMOs tediously easy. The hard content is out of my reach, so all I’m left with is easy-mode. There is no option that feels comfortable for a player like me. And I’m willing to wager a lot of other people are in the same boat. It creates other problems, too. The dearth of moderately challenging content means that the difficulty curve of most MMOs is actually more of a cliff. Most people are left without the incentive or the opportunity to improve their skills. Of course, some people manage anyway, but is it any wonder so few people manage to make the jump to raiding when it is so unlike the trivial open world content they’re used to? The really frustrating thing here is that I’m not sure I know what can be done to fix this problem. For all the reasons listed above and more, this is a very complex issue, and I’m not sure there are any easy answers. You want to find a way to provide a greater variety of difficulty options and more challenge for those who crave it without alienating too many people in the process. In a perfect world, I’d love to see MMOs have a wealth of global difficulty settings the way single-player games do, but I’m not sure how you make that work in a shared world game. The closest I’ve seen is Kritika Online, which has a variety of difficulty settings for its instances, but that’s a game of nothing but instances. How would that work in an open world? You could make specific zones, quests, and dungeons that are designed to be a step up in difficulty, but then you’re effectively cutting down on the available content for people who can only handle the easy stuff, and if the more challenging content is more rewarding (which is only fair), you risk creating a situation of haves and have-nots. And while for the sake of my sanity I have to believe most people could handle a greater challenge than you find in the average MMO, the fact is any increase in difficulty is going to drive away at least a few people, and that makes it a very hard sell to developers who want as many customers as possible. MMOs are too easy, but I won’t pretend I know how to fix it. This entry was posted in General MMOs, MMO Game Design, MMO Opinions, State of MMOs and tagged dark souls, Elder Scrolls Online, Kritika Online, Starcraft, The Secret World, World of Warcraft on September 18, 2017 by Tyler Bro.